This may sound obvious, but—when you’re pitching to film and TV—there is absolutely no room for a poorly sung, poorly performed, or poorly recorded version of your song. Why? You only have one chance to make a first impression. Put yourself in the position of the music supervisor or studio executive who is listening to hundreds of songs for a project. If the recording sounds like it was done by amateurs, or if the voice makes you lunge for the mouse or volume control, you’re ready to move on to the next song… regardless of whether or not you’ve heard the melody or lyrics, and regardless of how wonderful the song may be. In the end, you don’t want a poor recording or performance to bias the listener against your fantastic song before they have a chance to actually listen to it. This means that, if you want someone to give you money for your song, you might need to invest some money to present it in the best possible light. Randomly submitting songs in hopes of landing a placement doesn’t make much sense, and it’s a waste of your and the recipient’s time and energy. Pitching for opportunities that you aren’t a good fit for is not a sign of a professional, and doing so frequently can damage your reputation. By doing a little homework before submitting your song, you can avoid this waste and preserve your reputation. You need to find out which music supervisors are looking for music and which projects they need music looking for. Good places to start are industry pitch sheets and industry magazines, which often contain information on upcoming projects and who is looking for what. Once you know what the projects and who the contacts are, find out all you can about exactly what the contacts are looking for. Make sure your song fits those criteria. 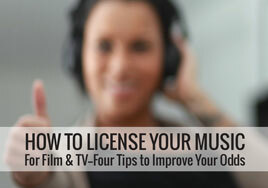 In order to give permission to a film or TV show to use your music, you will need to own your recording. Don’t let your pitch plans be derailed (or even delayed) down the line by musicians who won’t allow you to use their recorded performance, or by studios who stake a claim in your master recording. You can avoid this by obtaining the necessary releases up front from all session musicians and singers involved in the project and by making sure that the studio where you record gives you full ownership of the master recording. Having your songs “free and clear” for use also tells music supervisors that you’re a professional who knows what to do and who values their limited time. That’s a good impression to make. While it’s good to be able to write in a variety of styles, you and your music will be easier to remember if you become known for specializing in a particular style, especially if you’re known for doing it well. Since music supervisors are often asked to gather songs by style, being known as a “go-to” person in a style increases your odds of being remembered when the time comes. When it comes to placing songs in film and TV, being a great songwriter is often not enough. You need to be a savvy businessperson who is willing to take care of the unromantic day-in, day-out details of a career in music. You need to do the work, including the above steps. That being said, there is no greater thrill than turning on your TV or going to a theater and hearing one of your songs playing. Somehow, it makes all your effort worthwhile. Thanks for the advice. Great article! My band does cover versions of original hits and has been approached twice now for possible licensing of our covers for use in film. What special pitfalls should we watch out for? I’ve advised that separate permission and licensing must be obtained from the publisher of the originals first. But what other things should we be aware of? Jeff, you should be obtaining mechanical licenses for any cover songs that you record and distribute (through album sales, downloads, streams, etc). This might be what you’re referring to with “separate permission and licensing”. Beyond that, we’d recommend that you consult an entertainment attorney. They can verify whether or not you’re in the clear to move forward, advise on the next steps, and review all contracts.